Virgiliu Postolachi’s injury-time strike handed Thomas Tuchel his first win as Paris Saint-Germain coach after a pulsating 3-2 victory over Atletico Madrid on Monday. Postolachi, 18, curled a stunning shot past Antonio Adan to settle the friendly after Atletico had recovered from 2-0 down, helped by Antoine Bernede’s own goal on 86 minutes. 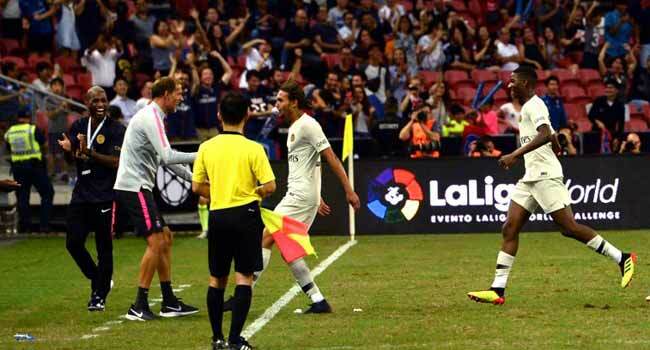 PSG welcomed back Angel Di Maria after World Cup duty and Italy’s Marco Verratti, but it was Christopher Nkunku and Moussa Diaby who put them 2-0 up before Victor Mollejo pulled one back for Atletico. Nkunku’s tap-in on 32 minutes was the highlight of a drab first half in front of 22,007 fans at the 55,000-capacity Singapore National Stadium. The lead was deserved for PSG, who had most of the play but created few clear chances apart from a long-range Di Maria free kick and Nkunku’s header from a Colin Dagba shot. PSG changed nine outfield players at half-time — a number that rose to 11 by 60 minutes, including an injury to substitute Alec Georgen — as the game opened up markedly. Eighteen-year-old Tim Weah was denied by Antonio Adan and Adan then saved from Moussa Diaby — who rattled the crossbar from the edge of the box shortly afterwards. But Diaby, 19, was not to be denied and made no mistake when he was selflessly put through by Weah on 71 minutes, planting his shot low and to Adan’s left. And with four minutes to go, they had a huge slice of luck when Borja Garces’s cross deflected off the helpless Bernede and into the PSG goal.